The basic requirements for domestic applicants to graduate programs at the University of New Mexico are as follows. Must hold a bachelor's degree from an accredited college or university in the United States or its equivalent in another country. Generally, applicants must have a cumulative grade point average of at least 3.0 (B) or its equivalent in their last two undergraduate years and in their major field. 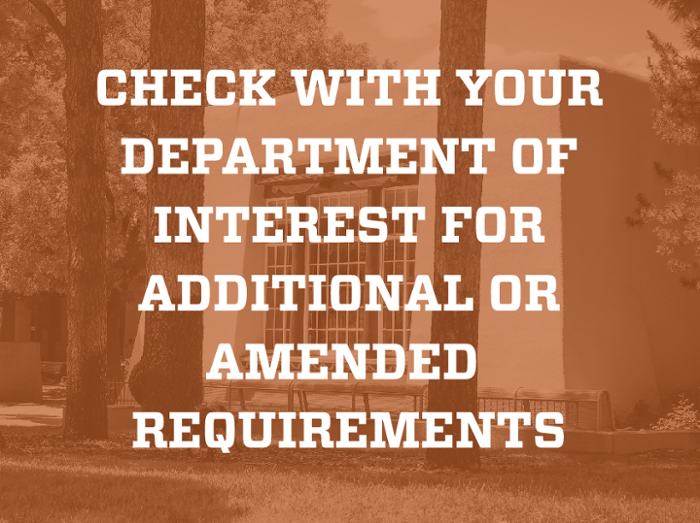 Must indicate all academic institutions they have previously attended on their applications. Failure to disclose any previous college attendance or any other misrepresentation of the record may result in disciplinary action, including revocation of admission to the University. In most departments, the minimum undergraduate prerequisite is 12 semester hours of upper division course work (300-level courses or higher) in the major field to which the student is applying, or in cognate areas. Some academic units at the University of New Mexico will admit students with a bachelor's degree directly into a doctoral program, though many admit only students who have earned a master's degree within the same or a different program from an accredited institution.